When we first heard about Tales from the Borderlands we were skeptical, because unlike other franchises Telltale decided to take over in the past, Borderlands was never a story-focused experience, but instead opting for addictive gameplay, loads of loot and a rich universe to explore, however Telltale somehow managed to use the Borderlands universe to craft a unique experience that takes full advantage of the source materials, while at the same time expanding on the already great universe of Borderlands. Your story starts as Rhys, a Hyperion employee who is on his way to get his well-deserved promotion, only to find out that the person who promised him his promotion in the first place is dead and has been replaced by Hugo Vasquez, who is now determined to demote Rhys to the position of janitor. This motives Rhys to leave for Pandora in the search of a Vault Key to prove to his Hyperion superiors that he is indeed worthy of that promotion and get back at Vasquez. There you will meet con artists Sasha and Fiona and take control of Fiona for the first time, in what is only small portion of what awaits you on Pandora. From there onward you will control both Rhys and Fiona as their accidental meeting will take them on a bigger journey around Pandora and back to Helios, full of intriguing characters, familiar scenery and unexpected plot twists along the way. It's hard to explain the magnificence of the game's story without spoiling it, but in the around 10 hours it takes to complete the game you will see and experience enough to get an overall idea about the universe without even having to play the main Borderlands games, although playing them beforehand certainly helps better understand the lore and background of the story, as this game takes place after the events of Borderlands 2. One unique treat we see in Tales from the Borderlands compared to other Telltale games is the many comedic scenes and humor-filled dialogues, as the world of Pandora takes a more silly approach on the wasteland compared to the more serious themes of Game of Thrones or The Walking Dead. The game will often show you a sketch of how things should go according to the plan as Rhys is describing it, only to end with a hilarious outcome, as the actual solution is often faster and easier to see than the overcomplicated methods of Rhys, but those flashbacks are the main attraction of this game's humor style. 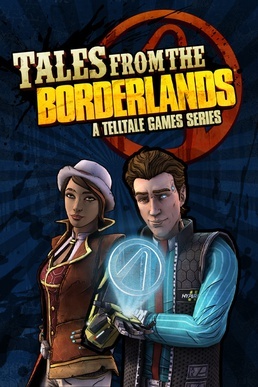 Just like every other Telltale game on the market, the gameplay is part dialogue, part quick time events and part exploration in a limited area, however compared to other games such as The Walking Dead or Game of Thrones, the exploration parts have been limited to only a few in Tales from the Borderlands, in favor of more action oriented moments, just like the ones Borderlands fans are used to. The main problem with that is that action in the Telltale engine means mashing a button or getting a bunch of directional movements of the left joystick in a row to avoid getting hit, which seems like not a big deal at first, but as the game moves forward those will become more frequent and require faster reaction times, which in a game that focuses mainly on the story can lead to the game catching you off-guard a lot of times, leading to your death just because you didn't see the "B" button prompt and react in time, and having to restart the whole sequence again, which wouldn't be that much of an issue if you could skip dialogue or cutscenes, but unfortunately that is not an option. Even with that in mind, Tales from the Borderlands is a step in the right direction making a Telltale game feel more like a game and less like a TV show with occasional button prompts as you can pick up items that you will use in another episode entirely and dialogue decisions might have an impact on the way the story unfolds, although it should be mentioned that not all decisions do, some of them only change one line of dialogue, but lead to the same conclusion nonetheless. On top of that each character has a unique ability that adds to the immersion into the game's world, with Rhys' echo eye allowing you to scan objects around the world and find your objective faster, along with Rhys' funny commentary on certain objects; on the other hand Fiona can find and grab cash along the way, allowing you to spend it on different customization items such as outfits for Fiona, Rhys, Sasha and Vaughn, as well as caravan skins. Although the Telltale engine is a little bit behind Borderlands 2 or even more frequently Borderlands the Pre-sequel, Telltale still kept the same art-style that made Borderlands so famous in the first place, and with a few minor exceptions and the occasional visual glitches the game looks great and the overall design of each location fits exactly the tone the game need to unfold its intriguing story. The visual prompts for quick time events are certainly an improvement since Telltales' first game, but as mentioned before, in the heat of the action it's easy to miss one, especially since you have a very limited amount of time to react, so there's definitely room for improvement even further. Luckily Telltale picked the very best voice actors in the industry to bring those characters to life, with game voice acting veterans Troy Baker, Nolan North and Laura Bailey taking the lead roles of Rhys, August and Fiona. Joining them is an even bigger cast of supporting actors such as Dameon Clarke who also voiced Handsome Jack in the main Borderlands games, Erin Yvette as Sasha, and Patrick Warburton as Hugo Vasquez. On top of that, Tales from the Borderlands has one of the best soundtracks in games in recent years, with tracks following the same style used in the main Borderlands franchise. If you have played a Telltale game before you know the deal, there is nothing else aside from the story here and all achievements can be earned in a single playthrough as they are all story related, however even if the game will end the same way no matter what, some decisions do impact certain outcomes, so you might want to play it a second time if you want to see everything the game has to offer. If you are a fan of Borderlands, you will most likely love this game just as much as you do the other games, as Telltale used the source material in a fantastic way to create a unique experience in the Borderlands universe, but even for other Telltale fans who aren't familiar with the franchise, the great story alone is enough reason to pick this game up, as you can enjoy it even without any previous knowledge of the Borderlands games.